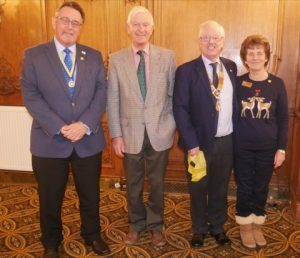 On December 14th 2017 Chairman and Secretary of the Trustees handed over a cheque for £5,000 to the President of the Rotary Club of Alnwick. Alnwick Rotary Club will be joining once again in a Rotary International Global Grant application to be commenced in 2018. The purpose of this grant will be to provide much needed surgical equipment for the University Hospital in Peradeniya, Sri Lanka which will be dedicated to operating on young cancer patients whose needs are very different from those of adults facing surgery. The Global Grant application will link Project Sri Lanka with the Rotary Club of Alnwick and the Rotary Club of Kandy. Our photograph shows the Chairman and Secretary handing over the cheque to the President of Alnwick Rotary Club, David Cant and the Treasurer, Terry Long.